The only food that can hit McDonald’s bar as hangover nosh is, perhaps, ramen noodles. By a stroke of luck, the fast food chain’s latest collaboration marries the two to create the dream team. 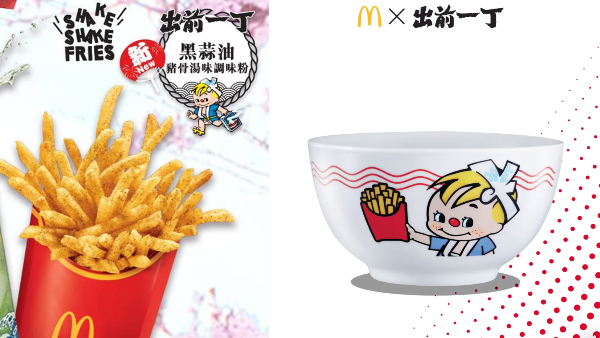 McDonald’s in Hong Kong has teamed up with Nissin—the producer of America’s Cup Noodles and Top Ramen—to unveil instant noodle-seasoned fries and a themed tableware set. The restaurant’s new ramen-inspired ‘Shake Shake Fries’ comes in two flavors: black garlic pork broth (from 27 February) and sesame oil (from 21 March). The powder arrives separate from the spuds, and is to be shaken in a paper bag with your fries so that each piece gets coated with that dangerously addictive topping. Elsewhere, the chain has also introduced a ceramic dinnerware set comprising a large bowl, a plate, and two HK$10 (US$1.27) coupons. The china come adorned with ‘Ching Chai’, Hong Kong’s beloved instant noodle mascot. Patrons simply have to upsize their meals to get a packet of the instant ramen flavoring along with their fries. A top-up of HK$98 (US$12.48) to any food order gets you the ceramic tableware set. Take notes, rest of the world: fries make the perfect vessel for instant ramen seasoning.